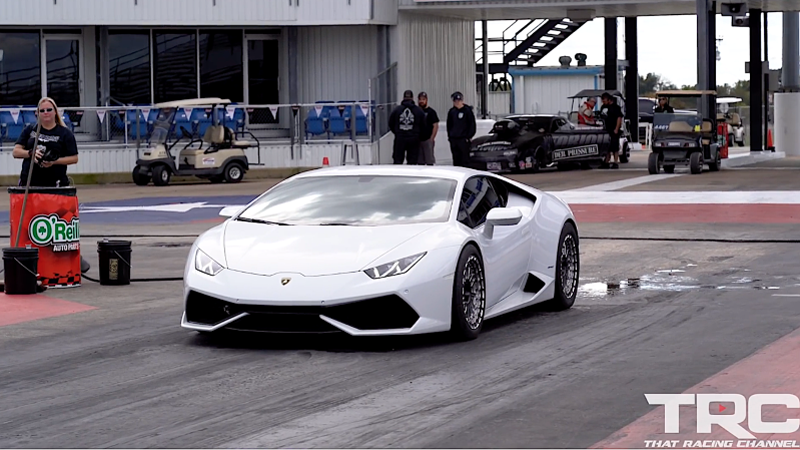 Dallas Performance recently brought out its 2,000-horsepower Lamborghini Huracán to a Florida drag racing event where it sprinted to the end of the quarter-mile track in only 7.916 seconds with a trap speed of 186.74 miles per hour. On top of that, this savage Lambo allegedly holds the Huracán half-mile top speed record of 208.2 mph. As That Racing Channel documented, when the right shop installs a twin-turbo setup on a Huracán, the cars will blow the doors off just about anything. The record-holding "baby Lambo" shows off over the 16 minutes of footage where it takes on a slew of other worthy competitors, like the much-feared, heavily-tuned R35 Nissan GT-R. While it wasn't the first company to tinker with the model, Dallas Performance is one of the top preferred Huracán shops in the country. With the Dallas Performance’s Stage Three kit installed, the Huracán gets new cylinder heads, cams, and—oh yeah— massive turbos. Tuning is also a key factor in making everything installed on this Lambo as fast as it is. The Stage Three DP package and a few other goodies give the car 2,000 hp, which is more than enough to slay the quarter-mile—it was actually built for half-mile racing, but the 18-inch drag radial swap makes it operate just as well at shorter sprints. Measured acceleration figures pin the car reaching 60 mph from a standstill in just 1.8 seconds. Then, it hustles from 60 mph to 130 mph in only 2.6 seconds, whooshing along as the car builds boost. Finally, perhaps the most impressive number comes in the shape of 100 mph to 150 mph, a gap which it bridges in only 2.29 seconds. With the excellent base and high-performance modifications, the Huracán’s racing dominance should come of no surprise to anyone.